A new day: Copic/Watercolor meet up! I’ve shared a number of Copic watercolor techniques before…but not Copic PLUS watercolor! So why not? Dear Copic/watercolor: meet and be friends! I was at a craft retreat the weekend before last, and Dawn from WPlus9 was there and working on samples for her release today. 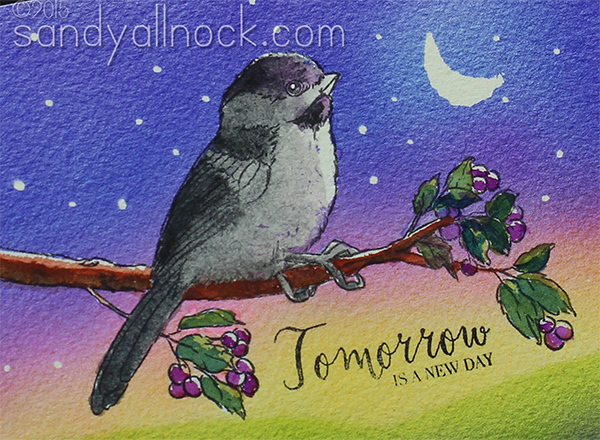 When she wasn’t looking I snuck the “A New Day” set and stamped a few on some watercolor paper so I could play too! And I’ll be ordering this set this morning – it’s soooooo pretty! Watch the video below to see how I created the cool Copic airbrush background (read THIS post if you want to know more about the system and what you need to get started) – I can’t believe how beautiful that texture came out! You can also click HERE to watch it in HD on YouTube. So now you know I finally did it…Copic and watercolor on the same piece! 🙂 And without trying to make one medium look like the other! I’m definitely going to be exploiting the fact that my airbrush looks amazing on this fancy shmancy paper, too. 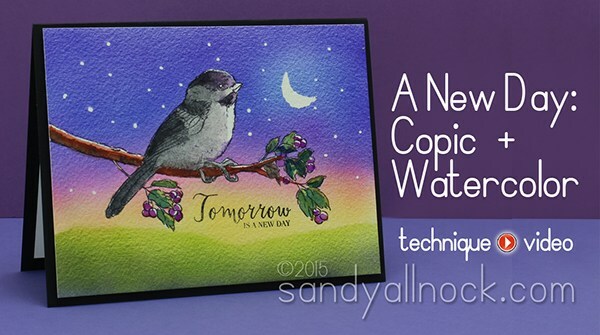 This is such a sweet little set, and will be perfect to make Copic/watercolor cards for some friends who’ve been going through rough times lately. It seems like these seasons come all at once – everyone’s got stuff, know what I mean? So the promise of a new day, a fresh tomorrow…that’s something that’ll work for everyone. Off to shop for this set as soon as they’re live! 🙂 OH and the new sprays from Wplus9 will just happen to hop into my cart too – wayyyyyyy too cool for school! Not sure if I have other ways to make copic/watercolor on one card with both mediums, but you know I’ll be trying! Hi Sandy, I have been watching your videos for a while and don’t know why I hadn’t subscribed to your blog, but I did today. So I saw your answer to another viewer, but thought I might just reiterate, that the air brush would not work with spectrum noirs? Thanks! P.S. I ABSOLUTELY LOVE your painting of Mary and Jesus, it brought me to tears and I find myself watching it over and over! So lovely. Love listening to your thought process as you create, and your work is always amazing. Another fabulous card! Coming to your blog is always a high point in my day. Thank you SO much for all you do and all you share. I love it. That airbrush tool is neat too. I have the old school airbrush that I never use as well as the airbrush my Dad had when he was in art school at The Maryland Institute of Art, in Baltimore, way back in the late 1930s. Will this one, the Copics, work with any markers? All of you work is amazing. No, it only works with Copic. Its best with Sketch or Original, but you can make a shim to make it work with Ciaos. This is beautiful. Your ability to create such lovely scenes with whatever medium you choose is amazing. Your talent is never ending. God has blessed you. Thanks for sharing. Chickadees are my favorite! Beautiful work. I’m looking forward to your paper and paint recommendations. I used to watercolor, and have been inspired and encouraged by your work with both watercolor and copics. Your videos are a valuable resource to me. Thanks for doing all that work for us. Sandy this is stunning. Great work! So beautiful, Sandy! Love that amazing texture in the background!